I sent a thank-you copy of my book to an Amish friend in PA. He received it yesterday. He thanked me and let me know that he would read it asap, but admitted that “reading in the summer is like swimming in the winter for us here”. Which cracked me up, but made sense. I encountered the same thing when selling books in Amish communities. Still, he is a trooper and is going to try to give it a read even though the days are getting warm and long. How about under the tree outside? 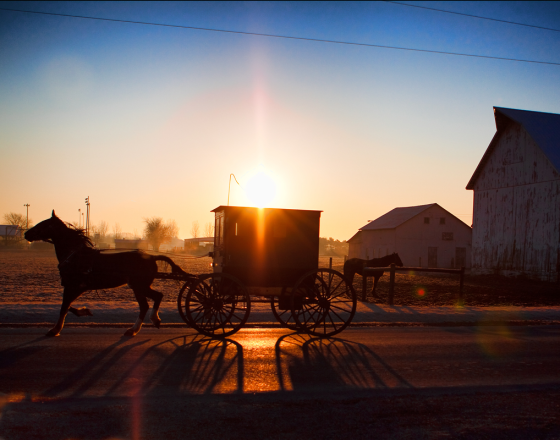 You’ll see that today we have another nice photo of the Arthur Illinois Amish community from Walter Blackledge. Walter, we’re out of your great photos, if you’re reading this, send more!! I’m far from being a publicity hound, but realize it’s part of the book process, and I’ve found it an interesting experience. Was on MSNBC last Friday for a brief interview on the book. Got the call the night before. We did it out of a local affiliate station here in Raleigh, NC, which is where I am until I return to Lancaster County next week. It’s an odd experience, because you look into a camera with an earpiece and a mike, but you can’t see anyone–just had Contessa Brewer’s disembodied voice suddenly in my ear. Finished in a little over 2 minutes, but I was able to answer a couple of questions. Will post a clip if I can get one. Also, here is a link to a podcast of a radio interview I did last week for CA station KKZZ (no longer available). Coach Ron Tunick and his co-hosts asked some great questions and there was much laughter. One of the best: “What do the Amish do at night?” We had fun with that one. (I’m on the podcast starting at about the 2:50 mark). On Ron’s show, we talked about the Amish and education. I recently read an article about an Amish-raised man who is becoming a doctor. I mentioned Andy Yoder a couple of years ago when he got some media attention for the same reason. He also commented in this video on Amish cancer rates. Yes, publicity is a weird thing, I went through the same process a few years ago (not for writing a book though). It was exciting and embarrassing all at the same time. I hope to order the book soon – looking forward to reading it! Thanks magdalena–I think you described it well! you’re not too modest to share what your publicity was for I hope? thanks for the photos, Walter! I absolutely love the Arthur area – work in the area but live about an hour south. You photos speak to my heart! Erik – thanks so much for this site – I am enjoying it more and more each time I visit and find it provides a certain comfort at the end of stressful days! – so, I am also convinced to read the book!…. thanks again everyone for your interesting posts! Thanks so much Amy! I am honored that you find this blog helpful and are interested in the book. You live in a very special part of the world. I hope to make a return visit to Arthur, perhaps this year!